At Ojai Valley School, the whole school is like one big family, similar to having around 120 brothers and sisters. One thing that makes the OVS community like this is the annual fall camping trip. This trip is used to introduce the new students to the OVS lifestyle, and involve them in our big family. 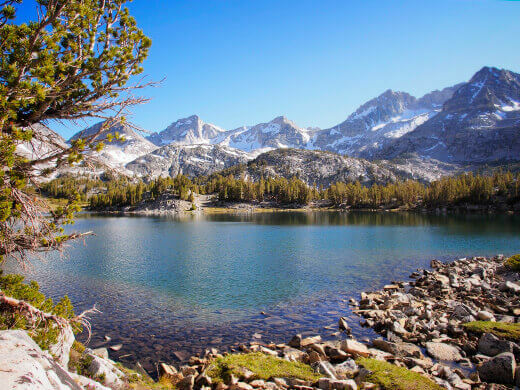 The trip I went on was to the Eastern Sierras, by Rock Creek Lodge. This trip was anything but a walk in the park with numerous ongoing lightning and thunder storms, the flooding of our tents, and hours of sitting in cars and waiting out the storms. The first day we got to the campsite our tent was a bit of a wreck, with broken poles and stuck zippers. The whole process of trying to set up the tent took around an hour, trying to hurry with the constant pressure of the storm sneaking up on us. That night, the lightning was less than a mile awhile away and when it would strike, the entire world to us would go white and then back to utter darkness. On the third day, as we drove into the canyon back to our campsite, it was like a scene straight out of a horror movie; leaving the clear blue skies behind and entering the gray fog covered world ahead. As soon and we drove beneath the ominous sky, the waters came down. When we arrived back at the campsite, Mr. Risser jumped out of the car and ran to a safe spot from the lightning to meet with the teachers. We were told to stay in the car, safe from the storm. We stayed in the crammed back of the truck for around an hour or two singing songs and eating quesadillas brought to us by the selected brave souls who were fearless enough to go out during the eye of the storm. We finally left the truck when darkness hit and sprang to our tents, straight into our sleeping bags. Two days before we headed back to school, a select few of us hiked to the most stunning valley we had ever seen. Luscious, green grass spread as far as the eye could see, while crystal clear, blue waters intersected them at the white shores. Picturesque mountains surrounded the valley sheltering us from the world outside. We hiked along a waterfall at the end of our journey, and jumped into the mind-numbingly water. Even though we couldn’t feel our legs from the chilling water, it had no effect on us because we couldn’t bare to look away from our exquisite surroundings. Although we endured many set backs during our trip, we were all heartbroken to leave, but excited to unfreeze our fingers and toes and take a shower.